Waterproof Toiletry Organizer with Hook Just $5.69 + FREE Shipping! You are here: Home / Great Deals / Amazon Deals / Waterproof Toiletry Organizer with Hook Just $5.69 + FREE Shipping! 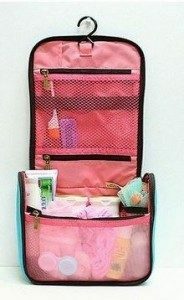 Here’s a great way to travel with toiletries! Head over to Amazon and get this Waterproof Toiletry Organizer with Hook for just $5.69. And, it will ship for FREE! There are three colors available – Deep Green, Pink, and Blue.